“It’s My Business” program aims to inspire entrepreneurship to middle-school students. Many examples of world-renowned entrepreneurs as well as business success stories are offered through games, quizzes and auctions. Through these examples, and with the help of visualization and introspection exercises, and the supervision of their volunteers, students grasp the main key factors for a successful start-up project: the entrepreneurial skills of the project leader, the importance of listening to the needs of the market, finding a “good idea” and selling it efficiently. At the end of the program, students will have developed entrepreneurial skills that they can apply to the classroom, their everyday life and their future careers. 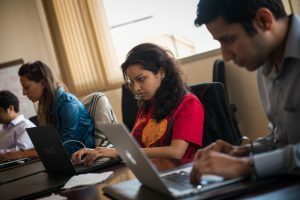 In small groups, students play the E-Quiz. They begin to identify entrepreneurial characteristics they have while discovering the career path of famous entrepreneurs. Recognize the key personality traits of the successful entrepreneur. In teams, students design a plan for a Teen Club. They work on the first entrepreneurial characteristics: meeting a need, studying customer needs and designing a product. Students begin to identify the skills and knowledge needed to start a business. Understand how entrepreneurs respond to market needs. Understand the role of market research in identifying needs and competitive advantages. In teams, students work on the second entrepreneurial characteristic: know your client and your product. Students discover means to offer the right products to the right customers. Create efficient ads for different companies. Students participate in an auction highlighting creative and innovative entrepreneurs and their business. Identify and suggest creative and innovative ideas. Analyzing current examples of social entrepreneurs, students identify business projects they might consider starting. They examine a way to use the four entrepreneurial characteristics to develop their business plan. Analyze how entrepreneurs use their knowledge and skills to start their own business. Students create their “Entrepreneur Profile” to grasp the fourth characteristic of entrepreneurship: Self-Confidence. Identify the characteristics they share with entrepreneurs. Concepts – business, customer, contractor, product, profit, service, creative, meet a need, innovation, market, market research, advertising, marketing, auction, buyer, business plan,, know your customer and product ,social entrepreneur, self-confidence. Skills-Active listening, deductive reasoning, following directions, teamwork, self-assessment, brainstorming, estimating, problem solving, creative thinking, decision making, budgeting, analyzing information, critical thinking, creative thinking, interpreting the information, comparing points of view. “It’s My Business” is recommended for middle school students. It is taught in six sessions of one-hour-and-a-half by a volunteer, preferably with more than 3 years of experience. It uses a playful training kit containing a counseling guide, “the student diaries” and media animation such as posters, paintings, carpets and playing cards.